It was about halfway through the campaign of Vanquish, the latest third-person shooter from Resident Evil creator Shinji Mikami, when I fully realized that the game was exceptionally cool. As hero Sam Gideon crouched quietly on a platform that crept through the pulsating innards of a reactor, a strong techno bass pounded out in the background to compliment the reactor's dull howls. At that moment, I stopped and realized just how sweet most moments in Vanquish are. This is more than just a sci-fi shooter -- Vanquish emphasizes style and skill just as much as explosions and gunfire. 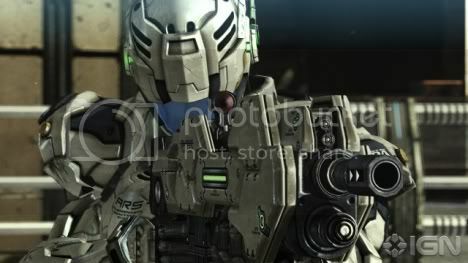 Vanquish, the fourth title from the talented developers at Platinum Games, is an incredibly fast-paced title. It takes place on an orbital space station called Providence, which has been taken over by a Russian extremist group known as the Order of the Russian Star. he station, which takes advantage of microwave energy, is weaponized by the extremists and turned on San Francisco, which is devastated by the attack. In response, the United States dispatches a full fleet to stop the extremists from continuing their assault on New York. Joining the military retaliation is DARPA researcher Sam Gideon, who comes equipped with the ARS battle suit. Officially, Sam is accompanying the military to gather Intel on the suit's performance on the field, but secretly Sam is conducting a rescue operation to locate the captive Professor Candide, creator of the energy system that powers the space station and the ARS suit. To me, this all sounds like fairly interesting (albeit traditional) sci-fi story-telling, but the plot is one of Vanquish's weakest parts. I'll touch on that in more detail later, but luckily the game's fantastic action and unique twists on third-person shooting keep it extremely entertaining from start to finish. When it comes to actual gunplay, Vanquish is similar to Western-developed shooters and it's rock solid. Sam will come across several different weapon types during his mission on Providence, including classics like the assault rifle, shotgun, rocket launcher, and sniper rifle. There are more intriguing weapons to be found, however, including a lock-on laser that fires beams of light skyward, and a low-frequency device that fires energy through walls. All these weapons are fun to use and useful in specific combat situations. En lo personal, el juego no me parece genial, como así lo describen más de uno. Si es bastante entretenido, tiene un gameplay muy cómodo y adaptable a cualquier persona que está acostumbrado a darle Shooters. Tiene un aire nuevo, pero sigue siendo, en lo personal, una historia un poco aburrida, aunque la peleas si son bastante entretenidas y lo meten a uno mucho. Los jefes son muy fáciles, no siento que me tuve que quebrar la cabeza mucho con algún jefe. El sonido del juego es bueno, y las gráficas también son buenas. El huso horario es GMT -6. La hora actual es: 12:50 AM.